(by David Blair, chief foreign correspondent, London’s Daily Telegraph) Ben Gurion International Airport, ISRAEL — …Security checks at Ben Gurion International Airport near Tel Aviv begin long before a passenger reaches the terminal building. At the airport entrance – over two miles from the check-in desks – armed guards screen every arriving vehicle and briefly question those inside. By the time a traveller is finally allowed to board a plane departing from Israel, he or she will have cleared no less than 12 layers of security. The disappearance of EgyptAir flight MS804 after its departure from Paris has raised more questions about the ability of European airports to protect their passengers. Next month, Ben Gurion airport will share its expertise with aviation security officials from 33 countries, including Britain and France. Israel has suffered decades of terrorism, but no-one has been killed or wounded inside Ben Gurion airport – or on board an aircraft departing from its runways – for the last 44 years. This was not a matter of chance. Ben Gurion is the only international airport in Israel, so the country would be isolated from the world if any terrorist group were to shut down its terminal buildings. Israel’s response is a multi-layered security system, starting at the airport’s perimeter entrance. Some passengers clear every hurdle with ease; others, by contrast, can be subjected to extra searches or lengthy questioning. Their fate depends on where they are placed in an individual threat assessment. A key moment occurs in the queue for the check-in desk. At this point, every passenger is interviewed by a security official. This encounter can last as little as a minute – after which the passenger is assessed as being of low threat and allowed to proceed. But this interview can lead to passengers being taken away for further questioning and searches. “We are looking for suspicious signs or abnormal behavior in order to increase our chances of detecting a terrorist as far as possible from the main target, the airplane,” said Mr. Zakay. This aspect of Ben Gurion’s security system is also controversial. Airport officials will not say what criteria they use to assess the threat posed by passengers. They deny this procedure amounts to profiling. But Arab Muslims are likely to be singled out for lengthy questioning, particularly if they have travelled elsewhere in the Middle East. Whereas European airports usually apply the same procedures to everyone, Ben Gurion’s doctrine is “risk-based security.” The system is designed to identify passengers who are believed to pose a high risk and subject them to special checks. Ben Gurion’s intensive security is possible partly because the airport remains relatively small by European standards. Last year, 16.5 million passengers went through its terminals, compared with 75 million at Heathrow and 66 million at Charles de Gaulle in Paris. Ben Gurion’s passenger traffic is barely half the level recorded by Heathrow’s Terminal Five alone. In addition, Ben Gurion is the only international airport in Israel, allowing the country to focus all of its effort and expertise on this one facility. Officials believe that Europe will never copy every aspect of Israel’s approach towards aviation security. But the central idea – that potentially dangerous passengers must be singled out as early as possible – is being applied in different ways by European airports. The era of one-size-fits-all security is coming to an end. 1. Where is Ben Gurion International Airport? 2. How many layers of security must a traveler go through before boarding a plane at Ben Gurion? 3. Why is security and preventing any terrorist attacks especially important at this airport? 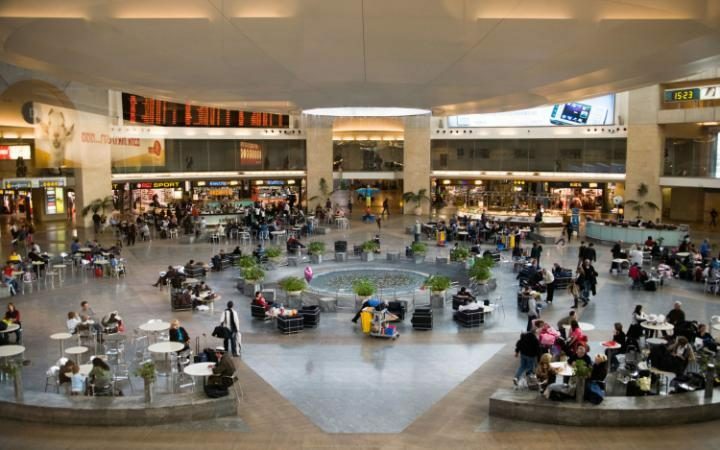 4. a) What factors affect a passenger’s trip through the security procedures at Ben Gurion? b) What do security screeners look for? 5. What is the safety record at Ben Gurion? 6. a) What is “risk based security”? b) Shmuel Zakay doesn’t think Israel’s security procedures would work in much larger European countries. Although they have five times as many passengers, these countries also have much greater resources. Do you think Europe should implement Israeli type security? Explain your answer. What do you think for the U.S. – should potentially dangerous passengers be singled out as early as possible? Explain your answer. 8. From para. 11: “Arab Muslims are likely to be singled out for lengthy questioning, particularly if they have travelled elsewhere in the Middle East.” Airport officials deny they use profiling. a) Do you think the Jewish state of Israel should not single out Arab Muslims for questioning? Explain your answer. b) Do you think your answer would be different if you traveled through Ben Gurion airport regularly? Explain your answer. In November 2015 it was reported that results of the U.S. inspector general investigation found that TSA screeners failed to detect 95 percent of prohibited items – including weapons and plastic explosives – planted by undercover investigators posing as passengers. Philip Baum, author of “Violence in the Skies: A History of Aircraft Hijacking and Bombing,” said “putting people through more hoops,” isn’t the answer to the ever-evolving threat. He said security personnel need to start using behavioral analysis to focus on negative intent. He also said they need better training, more flexibility and should start using more animals. “It’s all about making security less predictable,” Baum said. Do you agree with Mr. Baum’s assertion or do you think our TSA already does an excellent job and no change is needed? Or would some other change in security procedures be better? If so, what? Please explain your answer. All cars, taxis, buses and trucks go through a preliminary security checkpoint before entering the airport compound. Armed guards spot-check the vehicles by looking into cars, taxis and boarding buses, exchanging a few words with the driver and passengers. Armed security personnel stationed at the terminal entrances keep a close watch on those who enter the buildings. If someone arouses their suspicion or looks nervous, they may strike up a conversation to further assess the person’s intent. Plainclothes armed personnel patrol the area outside the building, and hidden surveillance cameras operate at all times. Inside the building, both uniformed and plainclothes security officers are on constant patrol. Departing passengers are personally questioned by security agents even before arriving at the check-in desk. This interview can last as little as a minute, or as long as an hour if a passenger is selected for additional screening. Luggage and body searches may be conducted. After check-in, all checked baggage is screened using sophisticated X-ray and CT scanners and put in a pressure chamber to trigger any possible explosive devices. Following the check-in process, passengers continue to personal security and passport control. Before passing through the metal detectors and putting carry-on baggage through the X-ray machine at the security checkpoint, passports and boarding passes are re-inspected and additional questions may be asked. Before boarding the aircraft, passports and boarding passes are verified once again. Security procedures for incoming flights are not as stringent, but passengers may be questioned by passport control depending on country of origin, or countries visited prior to arrival in Israel.